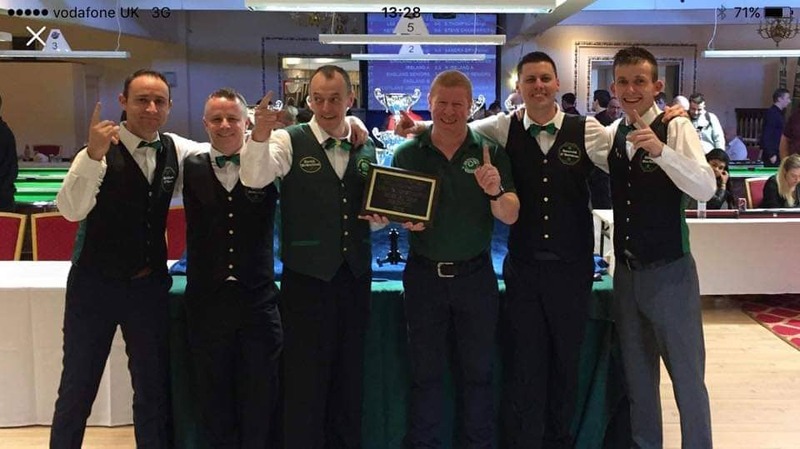 A huge well done to Gavin Donnelly that was part of the Irish mens team that won the Home Internationals in Stockport recently. 7 teams competed in this event, Ireland along with England, Wales, two Northern Ireland teams and two Scotland teams. 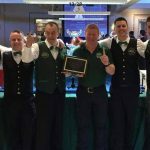 Ireland lost their opening match 8-7 to England but went on and won the remainder of their 5 games leaving them top of the table wining five from six. Northern Ireland A finished in second position so the cup was going to be travelling back across the water. The final started off a tight affair and after 6 games it was 3 – 3. Ireland then found their rhythm and went 7-4 up. They eventually closed out the match 8-5. Well done to Gavin who won 2/2 in the final and to his team mates Shaun Sharkey, Gearoid O’Gorman, Matt O’Hara and Dave McQuillan. Congrats to Shaun Sharkey who finished top of the individual stats winning 14 out of 18 frames.